100G transmission within data centers has made possible by using standard optical transceivers such as CFP and QSFP28 transceiver modules. Though they offer perfect fits for transferring 100G traffic within the rack and the data center, it becomes a problem when 100G traffic needs to be transported over long distances, like connectivity between geographically dispersed data centers over long distance (say over 40 km). This is where 100G DWDM QSFP transceiver finds its role to play. DWDM technology is nothing new to us since DWDM SFP transceivers have adopted in volume to expand 10G network capacity. 100G DWDM QSFP is very similar to its predecessor in regard to functionality, but it is typically applied in 100G network over longer span. Traditional DWDM solutions are designed for telecom carries that most companies cannot afford, which hinders it for being used in data centers. 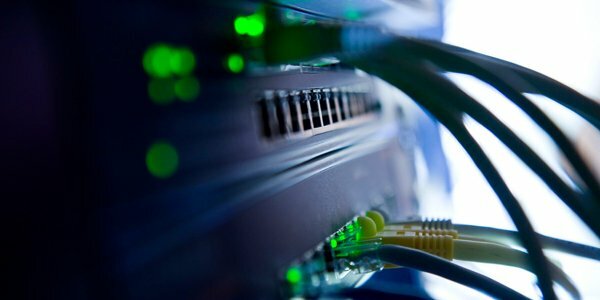 However, data centers are confronted with the ongoing demand for expanding network capacity over longer distances. Which drives the needs to replicate or transfer traffic between geographically separated data centers. In this case, either conventional DWDM solution or QSFP28 transceiver is sufficient. 100G DWDM QSFP transceiver thus becomes the technology of choice for 100g DWDM optical networking transport over long distances (up to 80 km). 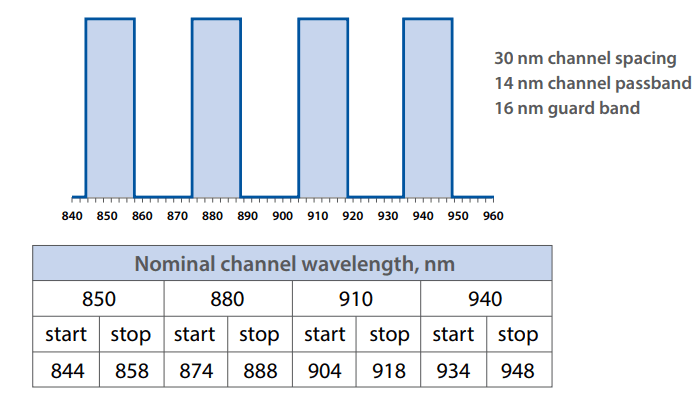 100G DWDM QSFP is based on an advanced modulation technique – PAM4. It takes the same form factor as 100G QSFP28 transceiver and can be used directly on switches with QSFP28 slots. The main advantages of DWDM QSFP PAM4 is the easiness to use regular electronics and optical components suitable for QSFP28 form factor. The power consumption is dramatically reduced and can be used for data center interconnect application. The drawbacks, however, is that DWDM QSFP PAM4 requires amplification and dispersion compensation system on the optical link for reach longer than 5km at 100Gbits. QSFP DWDM PAM4 provides a cost effective solution for metro Data Center Interconnect (DCI) for up to 80km reach at 100 Gigabit/s speed. The 100G DWDM QSFP leverages IEEE CAUI-4 4x25G electrical interface and is compatible with standard 100G QSFP28 ports. On the optical side, it combines two wavelengths into a duplex fiber with the center wavelength aligning with 100GHz grid. 100G DWDM QSFP PAM4 is available in 40 different channels on the 100GHz ITU-T grid to provide a maximum bandwidth of 4Tbps over a single pair of fiber. Interconnecting geographically dispersed data centers is critical to maintain application agility to meet various business needs, while data intensive applications are driving the rapid growth of cloud networks. 100G DWDM QSFP transceiver delivers up to 4Tbps of bandwidth for up to 80km reach between data centers. This can be achieved by using DWDM Mux/Demux, amplifier and dispersion compensator. 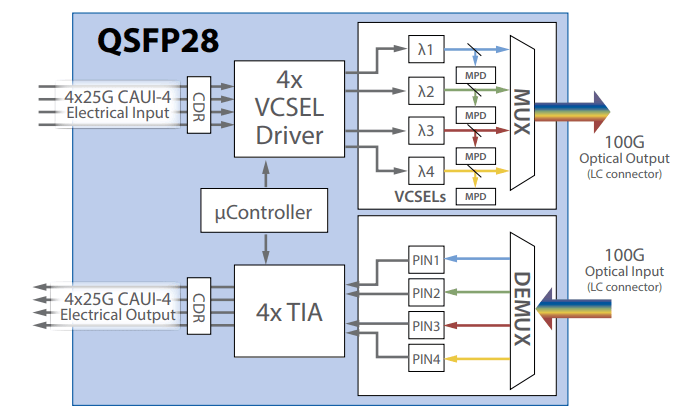 The Mux/Demux combines the different wavelengths of light into a pair of fiber. EDFA are used to boosts the signal. And a dispersion compensator is needed for applications over 5km. And DWDM is providing for efficient use of the single fiber pair with up to 40 wavelength multiplexed. The emerge of 100G DWDM QSFP PAM4 is a significant step forward in overcoming the difficulties of DWDM networking in data center equipment. ACG Research covering data center service providers indicated that 30-80 km optical reach is needed for about 30% of their data center interconnections, which predicts the prosperity of 100G DWDM QSFP transceiver. This entry was posted in Fiber Optic Transceivers and tagged 100G DWDM, 100G DWDM QSFP PAM4, DWDM QSFP, DWDM SFP, optical transceiver on March 30, 2018 by Aria Zhu. In the past few years, network speeds have increased dramatically as applications like video and technologies like virtualization need higher speed and performance. Therefore, 10 Gigabit Ethernet (10GbE) is widely deployed for inter-switch and server-to-switch links. Generally, there are two 10G switch solutions for the aforesaid 10GbE link: 10GBASE-T switch for copper and 10G SFP+ switch. And since the 10GbE copper switch is more favored by the market, this post will focus on copper10GBASE-T network switch recommendation. 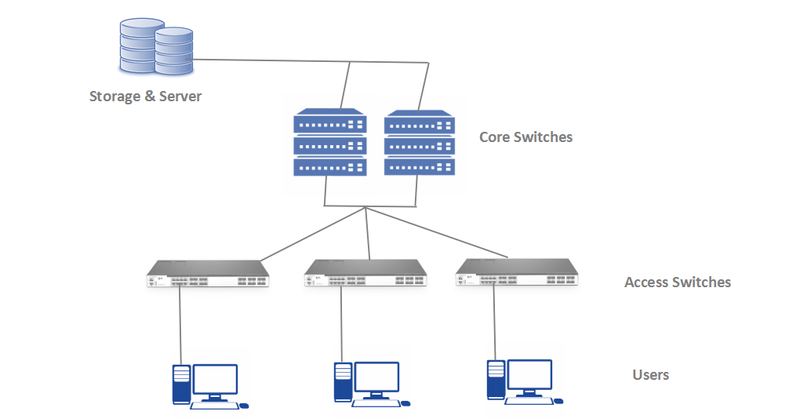 10GBASE-T Switch vs SFP+ Switch: Why Choose 10GBASE-T Copper Link? Many people may wonder why 10GBASE-T copper link is more favored by the market. This part will discuss this topic in a brief way. 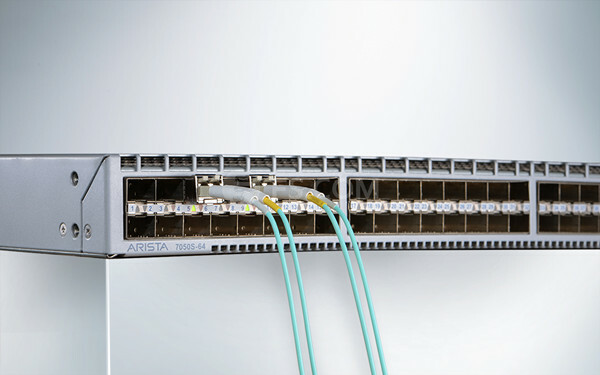 As we all know, copper 10GBASE-T switch uses copper cables to transmit 10Gbps data. This may help to save much money because copper cable infrastructure is far less expensive than the fiber optics of 10G SFP+ switch. 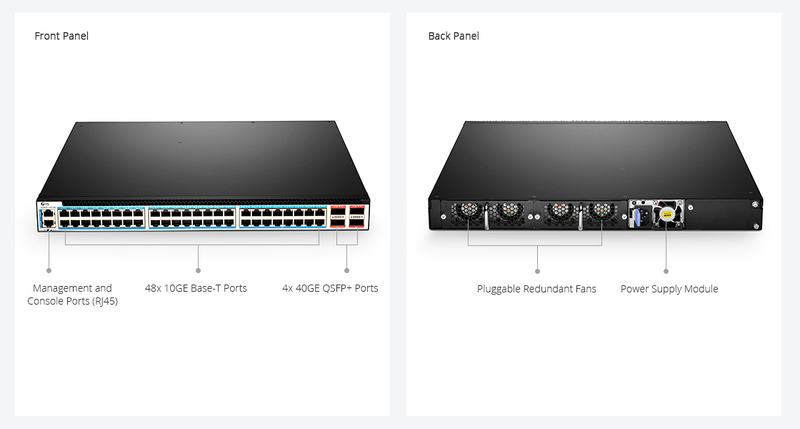 In addition, 10GBASE-T network is easier to be employed and allows users to make the best of their existing Cat6a UTP structured cabling ecosystem. Despite all this, 10G SFP+ link also has such advantages as lower latency and lower power budget. 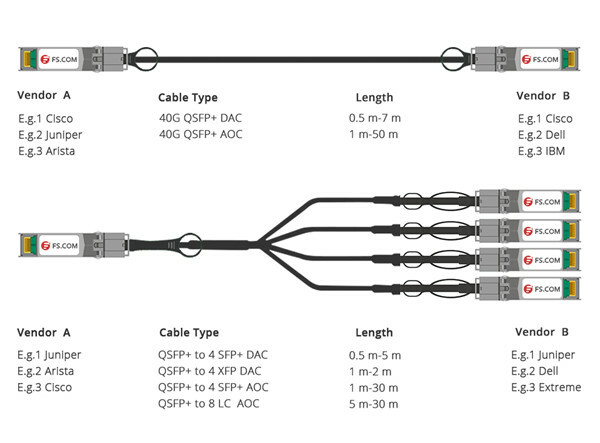 For detailed information, you may read 10GBASE-T VS SFP+: Which to Choose for 10GbE Data Center Cabling. Since 10GBASE-T network is favored by many IT managers, lots of cheap 10GB switch for copper has been supplied in the market. 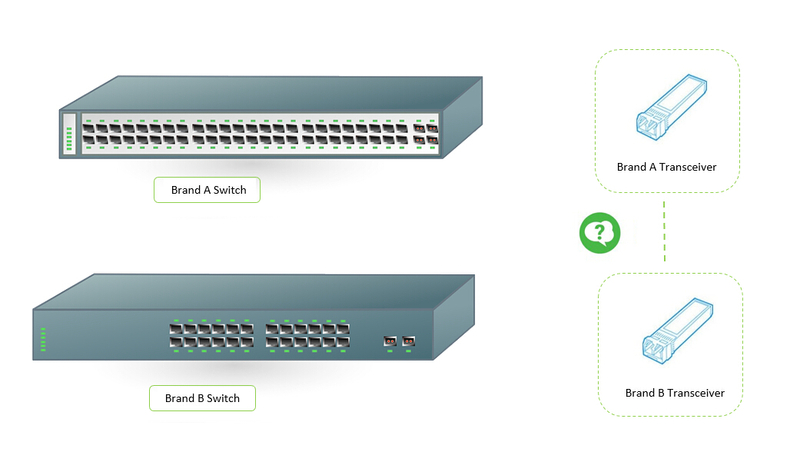 These switches are either 2/4/8/16 port copper switch for home networks or 20+ port 10GBASE-T switch for enterprise and data center networks. 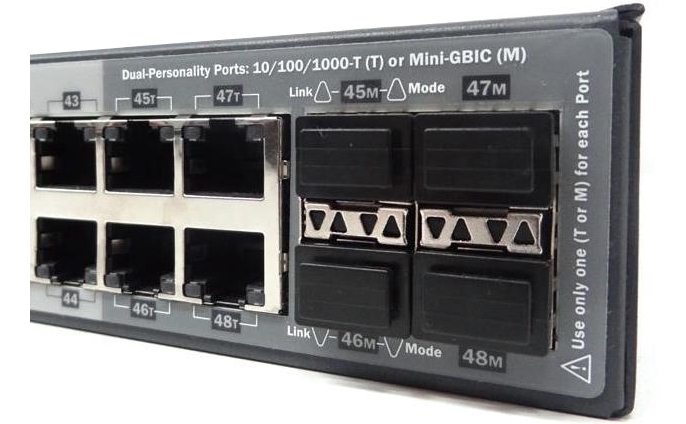 This part will introduce a high performance 48 port 10GBASE-T copper switch with 40Gbe QSFP+ UpLink – S5850-48T4Q – for your reference. 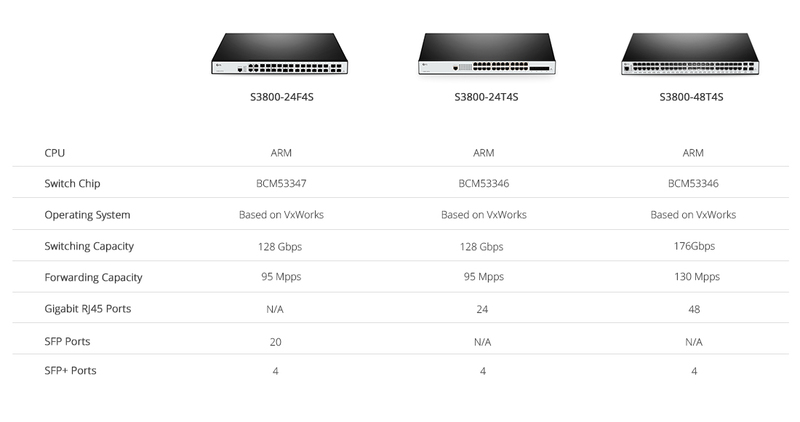 Seen from the above table, you may find that the ports and performance of the three copper 10GBASE-T switches are nearly the same, but Cisco Nexus 3064-T and Brocade VDX 6740T switches are much more expensive than the S5850-48T4Q. This is because their prices include both the actual value of the switch and their specific brands which are always costly. And their after-sale services may be better than most small companies. However, this FS S5850-48T4Q switch is also guaranteed with free tech support and back up support. 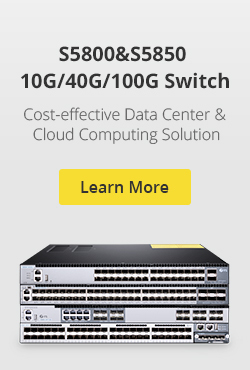 For lower cost and ease of use, copper 10GBASE-T switch is popular among 10Gb switches. If you plan to migrate to 10GbE network, 10GBASE-T copper network is a good choice. It will help to reduce the cost complexity and cabling issues around the migration to 10GbE in the data center. This entry was posted in Optical Switches, Switch & Transceiver and tagged 10G SFP+ switch, 10GBASE-T switch, 10GBASE-T vs SFP+ on November 15, 2017 by Amelia.Liu. 10G Twinax vs Fiber: SFP+ Copper Cable or SFP+ SR Module? Over the years, 10GbE has successfully stretch its reach from enterprise data centers to midmarket networks due to the increased bandwidth requirements and the growth of enterprise applications. As the deployment of 10GbE is going boarder, it is important to understand how to effectively leverage the technology to better satisfy your network demand. Thus, all elements should be carefully reviewed to choose the appropriate cabling solution for your workloads. Many customers facing the problem to choose from 10G twinax vs fiber (SFP+ copper cable vs SFP+ SR) as both are viable options for short range. This is what we are about to figure out in this article. 10G twinax vs fiber for short reach connection? Before we go any further, it’s better to take a glimpse of what SFP+ direct attach cable （DAC）are and what role they play. A SFP+ DAC cable, also known as SFP+ twinax copper cable, is effectively viewed as a transparent cable to the switch. It is a cable invented with each end physically resembling an 10g SFP+ transceiver, but with none of the expensive electronic components. 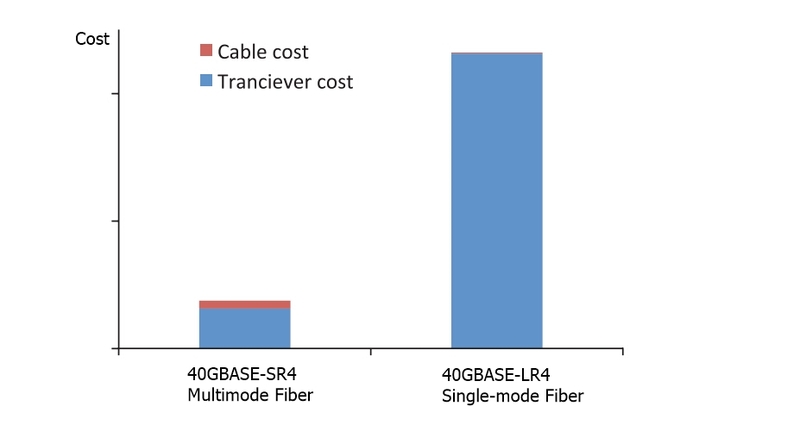 Although being even more pricy than fiber optic cables, SFP+ Copper Cables effectively eliminate the expensive optical transceiver required in the equipment they connected. SFP+ Copper Cables comes to two different flavors: passive and active. Passive SFP+ Copper Cables requires little to no direct power to operate, and are extremely affordable with the length ranging from 0.5m all the way up to 7m. Active SFP+ Copper Cables integrates signal processing circuitry into its built-in connectors and actively powering those circuits with DC power provided by the switch. The circuitry in active sfp+ cable thus brings up the overall cost. This partly explains why active sfp+ cable is usually more expensive than its passive counterparts. For 10G twinax vs fiber, we cannot make our decisions until we clear knows each function. SFP+ SR are similarly used for short runs, and that is exactly “SR” stands for – short reach. 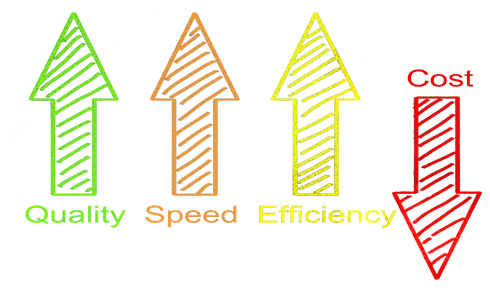 SR transceivers are almost always multimode, and optimized for high speeds over relatively short distances. It operates at 850 nm, and can reach up to 300 m with laser-optimized OM3 and 400 m with OM4. The 10G SFP+ SR transceiver module offer a flexible connectivity option for data centers, enterprise wiring closets, and service provider transport applications. 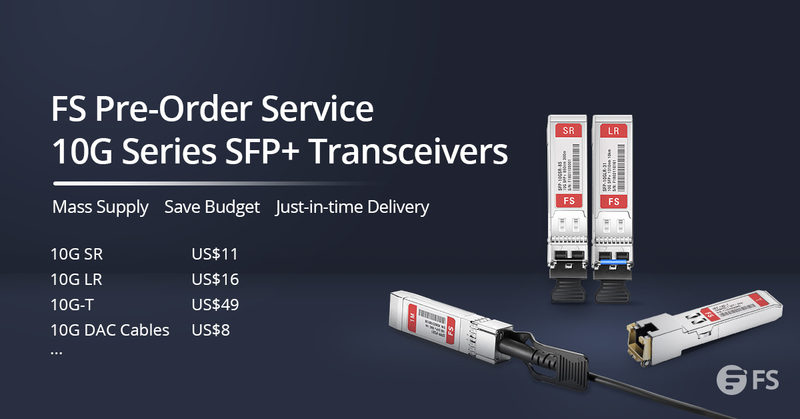 The price is the major issue that some customers turn to SFP+ Copper twinax cable instead of SFP+ SR transceivers for short runs, especially for those who are under tight budget. Fortunately, third-party optics has narrowed down the price gap by providing decent performance transceiver modules with only a fraction of the cost at the original ones. When choosing between 10G twinaxs vs fiber, the following factors have to be well considered. Distance: Advocators of SFP+ twinax copper cable insist that, if distance is not a problem, they tend to choose SFP+ cable because of the lower power needs and lower latency it provides, and the power saving alone is significant. Not to mention that the cable itself is less fragile and more durable. As SFP+ twinax cable only reach up to 10m, when distance happens to be a factor, SFP+ SR transceiver can get much longer reach and more compatibility anyway. Or if the switches are connected via patch panel, then your hand is forced to 10G SFP+ SR transceiver and fiber. To sum it up, SFP+ cables are used within the rack to connect servers and storage to ToR switches, it is an “intra-rack” thing, whereas SFP+ SR in for connection between racks – known as “inter-rack” cabling. Cable management: in terms of managing cables, fibers are believed easier to work with – it has no limit of cable length as with SFP+ cables. As for bulky and thick SFP+ cables it is fine for same rack FEX extension or one or two servers, but load half a rack with a top of rack FEX/switch with twinax, you will have mass of inflexible copper at the back of the rack. And that can be a nightmare. Cost: 10G optical transceivers are much expensive than 10G SFP+ copper cable – these might be the driven course for people using twinax over SR optics. However, the booming of third party optics well addressed the issue by providing full compatible and trustworthy transceiver modules, which on the other hand, significantly reduces the cost of optics. Since the price gap between SFP+ cables and SR SFP+ optics is reduced, it bestowed customers more chances to weight other affecting factors. Uniformity: users prefer to use SFP+ SR when working with different vendors, it’s less likely to run into issues if you use optical transceivers. 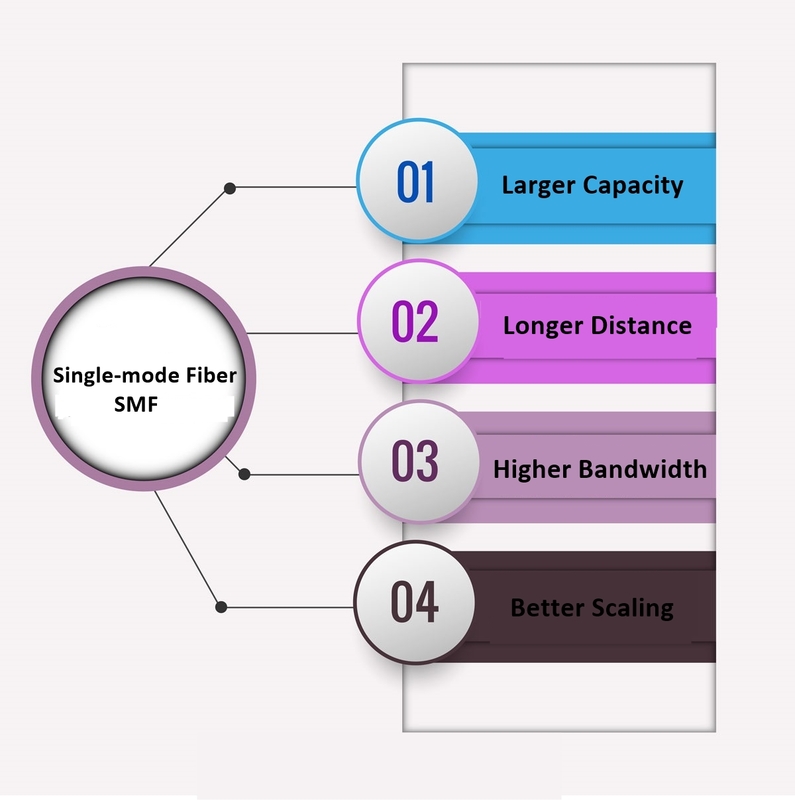 Truly, SFP+ SR indeed makes multi-vendor environment cabling much easier: imagine that you have to connect two switches from different vendor, simply use two SR transceivers that compatible with each brand switch can well solve the problem. However, if cost really matters, you can equally choose this special made SFP+ twinax cable from FS – different brands can be made at each ends, which are compatible with the major vendor on the market. 10G twinax vs fiber, from a network perspective, the SFP+ twinax cable is fine and a lot cheaper for very limited short runs – typically intra rack cabling, while for mass adoption, they become absolutely thick and unmanageable. 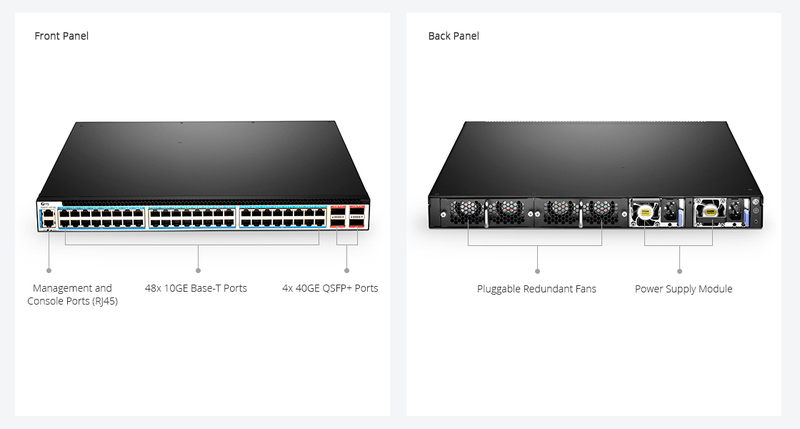 So it’s worth the savings if your switch is in the same rack as the equipment you are connecting, and if it goes to another rack, SFP+ SR with fiber and a patch panel can be a sound option. With SR optics, you have much more flexibility in the placement of servers and how you lay out your racks. It is the obvious choice once the demand for bandwidth and length becomes more acute and cable management and future growth becomes critical. This entry was posted in Cabling Solutions, SFP+ Transceiver and tagged 10g twinax vs fiber, SFP+ DAC, SFP+ SR on November 10, 2017 by Aria Zhu. It is hence safe to say that when connecting two fiber optic transceivers from different fiber optic transceiver manufacturers, you can expect your fiber patch cable to lead a consistent link as long as you use modules of the same Ethernet protocol, cable type and working wavelength. 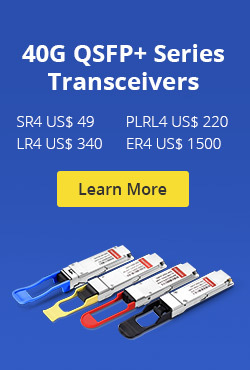 FS provides fully compatible optical transceivers with affordable price and decent performance. For more information, please visit www.fs.com. This entry was posted in Fiber Optic Transceivers, SFP Transceiver, SFP+ Transceiver and tagged fiber optic transceiver, optical transceivers, sfp transceiver on October 21, 2017 by Aria Zhu.